U.S. Vice President Mike Pence has warned that the United States has not ruled out using military force to deal with an increasing nuclear threat from North Korea. He spoke of recent U.S. military strikes in Syria and Afghanistan as evidence of President Trump's "strength and resolve." The warning came as Pence visited South Korea at the start of a four-nation Asia trip. He spoke during a joint appearance in Seoul with South Korea's acting president, Hwang Kyo-ahn. Pence urged the U.S. to move away from a previous policy of what he called "strategic patience." He said this policy had failed to produce lasting progress with North Korea. "For more than two decades, the United States and our allies have worked to peacefully dismantle North Korea's nuclear program, and alleviate the suffering of their people. But at every step of the way, North Korea answered our overtures with willful deception, broken promises and nuclear and missile tests." Pence noted that during the past 18 months, North Korea had carried out two nuclear tests and more missile tests than ever before. Kim Jong Un's government conducted its latest missile test on Sunday, just before Pence's arrival. The test failed when the missile exploded shortly after launch. While Vice President Pence is in Asia, he is expected to seek support for increasing pressure on North Korea to end its nuclear and missile development programs. 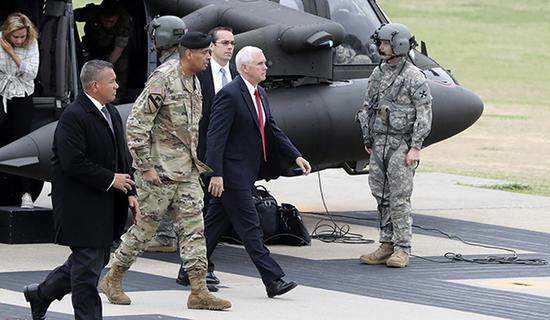 "All options are on the table," Pence told reporters at the Demilitarized Zone (DMZ) that separates North and South Korea. However, U.S. National Security Adviser H.R. McMaster said he is not currently considering a military option. On a TV news program, McMaster said U.S. officials are aiming to contain the threat peacefully. The Trump administration is reportedly considering new economic restrictions on North Korea. These could include an oil embargo, a global ban on its airline, stopping cargo ships, and punishing Chinese banks that do business with North Korean companies. China remains an important partner for the U.S. on North Korea. But Chinese officials have not supported strong measures against North Korea, which is a close ally of China. Those measures could cause instability at China's border and increase U.S. power in the area. A Chinese Foreign Ministry spokesman called for restarting multi-party talks that ended without agreement in 2009. He also spoke out against deploying the THAAD missile defense system in South Korea. Both Pence and Hwang repeated their support for THAAD as a way to protect against North Korean missile strikes. In Tokyo, Japanese Prime Minister Shinzo Abe said a "diplomatic effort is important to maintain peace" on the Korean Peninsula. But he said "dialogue for the sake of having dialogue" is useless. "We need to apply pressure on North Korea so they seriously respond to a dialogue," Abe told a parliamentary meeting. He urged the international community, especially China and Russia, to play a bigger role in the issue. The Prime Minister is believed to have ruled out cuts in child benefit or pensions. A fishing vessel and a cargo ship collided in rough seas. He moved away and broke off relations with the family. In September there were reports of a large-scale missile test in western China. 1.But he said "dialogue for the sake of having dialogue" is useless. He urged them to set aside minor differences for the sake of peace. She called on us merely for the sake of courtesy. 2.He urged the international community, especially China and Russia, to play a bigger role in the issue. He was invited to play a role in this TV play. Genes play a role in how your body balances calories and energy.